A fun fair for children from all PMC (Pune Municipal Corporation) schools in Kothrud area was organized on the occasion of Children's Day. Various fun activities like storytelling, streetplay, group songs, and dance, etc. 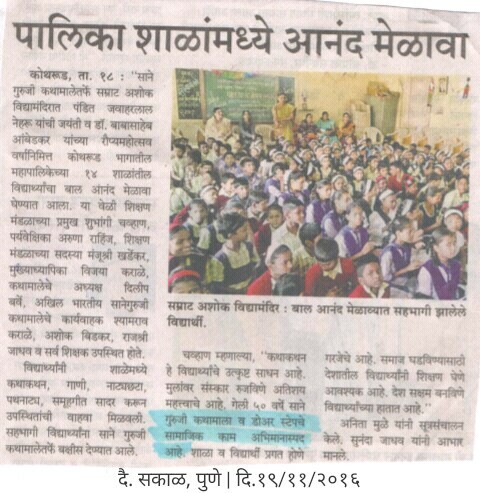 were conducted at Samrat Ashok Vidyamandir in Karvenagar. Door Step School set up a stall of innovative teaching tools for learning mathematics. Children from various schools in Kothrud area visited the stall with lot of curiosity and enthusiasm. A group of children from Door Step School's Baal Gat performed a streetplay on topic of Child Rights, which was much appreciated by school teachers and government officials present at the function.